I bowled up 'Sheba' this afternoon to see how she was growing and attempt to get a decent pic for Mark and Lisa. I am very pleased with how this fish is growing though. She is from a July 2016 spawning and I've had her just over a year. She is currently carrying a few eggs but she will soon be going through a period without food so that should fix that. Should the text on the right say "Oct 2018" or have I missed something? Impressive how she's hardly changed colour-wise. 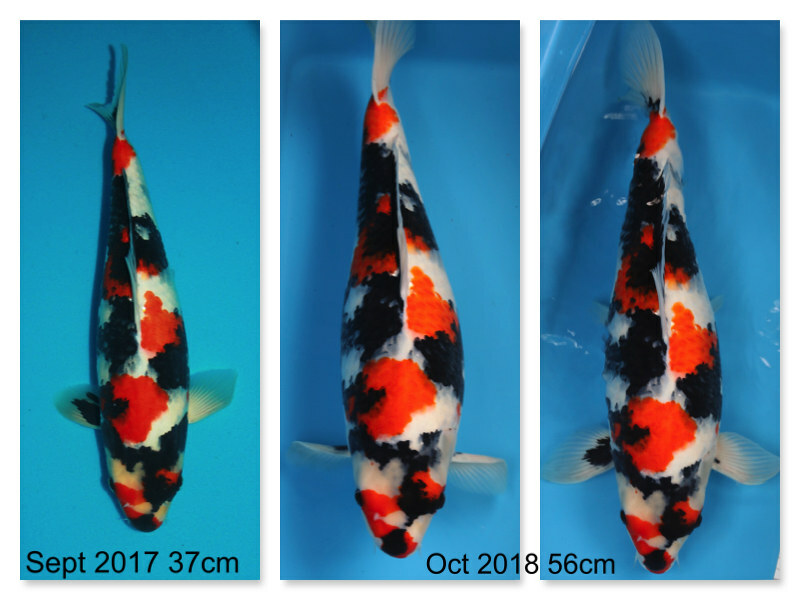 I'm still quite new to Koi so don't know why some don't change, but half of mine bought between May and June are unrecognisable as being the same Koi through constant colour changes. Some for the better, others not so. My cuttbrook shiro do not lose their sumi, whereas other fish I have had done. Weirdly the bloodline of the Cuttlebrook shiro is actually Omosako, yet my Omaosako shiro’s sumi has still not really developed after 2 years in the pond. There is a lot of luck involved if you buy fish as tosai or nisai. Lovely Showa Lara,never been to Cuttlebrook one place i must go to. Awsome think i remember commenting on how lovely this showa is when you first got it feline doing really well and colours staying well too ay. Same as you john ive never been to cuttlebrook, its a hike from me but i must get there one day. Never heard anything but praise for them and seen plenty of good lovely koi from them so its defo on my card.